From user profiles and location information to IP addresses and RFID, the world of information technology has evolved at a rapid pace, exposing both individuals and organizations to new levels of risk – and responsibility. Yet, data protection and privacy laws are still applying a definition of “personal information” that was developed in the 1970s. It’s time to take a fresh look at the definition and develop a new legal framework for assessing which data should be classified as personal information. 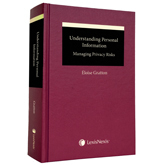 And that’s precisely what this publication, Understanding Personal Information: Managing Privacy Risks, aims to do. This book was quoted by the Supreme Court of Canada in the recent decision Alberta (Information and Privacy Commissioner) v. UFCW, Local 401, 2013 SCC 62. This content has been updated on August 17, 2015 at 15 h 05 min.